Working-class family man Christopher Robin encounters his childhood friend Winnie-the-Pooh, and the bear helps him to rediscover the joys of life. When Christopher Robin hit screens in summer 2018, one could excuse audiences who felt a sense of déjà vu. After all, Goodbye Christopher Robin came out about 10 months earlier, and the similar titles caused inevitable confusion. However, this didn’t keep audiences from the 2018 film – maybe because most potential viewers apparently didn’t know Goodbye existed. Whereas Goodbye earned less than $2 million at the box office, the 2018 flick brought in nearly $200 million worldwide. Perhaps this happened because Christopher Robin went with a more “family-friendly” tale. Whereas Goodbye tried for a dramatic feel, the 2018 effort embraces the line between reality and fantasy. 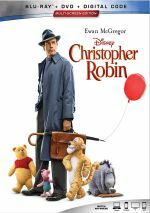 Set in London after World War II, Christopher Robin (Ewan McGregor) works for a luggage company and lives with wife Evelyn (Hayley Atwell) and daughter Madeline (Bronte Carmichael). As a child he enjoyed imaginary adventures with various animals in the Hundred Acre Wood, but those ended when he went to boarding school. Except it turns out Christopher’s pals Winnie the Pooh (voiced by Jim Cummings) and the others weren’t so imaginary after all. After a long slumber, Pooh awakens and can’t find his buddies. Eager to reunite with his friends, Pooh makes his way to Christopher’s abode in London, an action that sets off a series of improbable adventures. Director Marc Forster also made 2004’s Finding Neverland, a tale about Peter Pan creator JM Barrie. I guess that qualified him to take the reins for Robin, even though Neverland offered a more reality-focused tale. 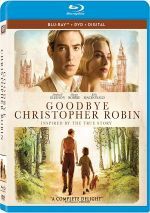 Whereas Goodbye tried to dramatize the life of Pooh author AA Milne, Christopher Robin goes for total fantasy, as it never attempts to connect to the real character behind Christopher. This seems like a questionable choice on the surface, but in the end, it works out fairly well. Though expect some confusion along the way, as it becomes difficult to tell how much of Robin we’re intended to view as “real” and how much should be seen as fantasy. Initially, I assumed that the movie would treat Pooh and friends as figments of Christopher’s imagination, characters who come to life in his mind and that’s it. Nope - Robin clearly presents Pooh and pals as living participants in the story, though it hedges its bets in that realm. Enough scenes make it obvious that Pooh and the others do exist as “real” but the film keeps this side of the story so vague that one could miss these signs. This remains a surprising choice for me, especially given the movie’s theme. Robin is really about Christopher’s dowdiness, as the adult character seems to have completely forgotten how to have fun. As such, I expected Robin to show us how Christopher rekindles the child inside, one who imagines marvelous adventures. The choice to make his youthful experiences real somewhat blunts the impact of his internal revival. Despite this potentially problematic choice – and a fairly cliché theme - Robin works fairly well. Granted, it takes a while to get going, and we don’t view Pooh’s revival until almost half an hour into the story. Once he reappears, Robin immediately gains charm and starts to come to life. As I stated, the narrative feels less than innovative, but the inclusion of Pooh and (eventually) his pals adds some fun and allows matters to take unusual twists. McGregor does a nice job as the adult Christopher. He manages to encapsulate the character’s mid-life dullness but he doesn’t overplay Christopher’s revival as he gradually re-embraces his inner child. McGregor grounds the film and allows us to buy the story, despite all the improbable moments. Cummings has played Pooh for decades, and he does a nice spin on the part. He adds charm to the tale and helps us invest in the overall journey. At no point does Robin threaten to become an especially fresh adventure, as it does come saddled with a fair number of clichés. Nonetheless, the filmmakers deliver the material with such warmth and wit that it becomes a likable tale. Footnote: stick around through the end credits for a tag with a cameo from a Disney notable. Christopher Robin appears in an aspect ratio of approximately 2.39:1 on this Blu-ray Disc. This became an excellent presentation. Many period pieces opt for subdued palettes, and that was definitely true here. The colors of Robin tended toward a laid-back mix of orange/amber and teal, without much to call vivid. Still, these were fine given the stylistic choices. Despite the fantasy elements, the film’s DTS-HD MA 7.1 mix stayed fairly subdued. This was a chatty flick, though it occasionally displayed lively elements. A few action-ish moments related to trains and Pooh’s adventures fared best, as those showed movement and range. These were pretty infrequent, though, so good stereo music and general ambience ruled the day. This meant we got a nice sense of place but rarely much more. Four featurettes appear here, and we start with A Movie Is Made for Pooh. It runs five minutes, 28 seconds and includes notes from director Marc Forster, producers Brigham Taylor and Kristin Burr, senior art director Nick Dent, visual effects supervisor Christopher Lawrence, and actors Ewan McGregor, Hayley Atwell, Bronte Carmichael, Orton O’Brien and Jim Cummings. “Made” examines character design and influences, and the animals’ interaction with humans. A few decent notes emerge – along with some fun test footage – but a lot of happy talk pervades the show. Next comes Pooh Finds His Voice, a two-minute, 43-second reel with Taylor, Cummings, and Burr. As implied, we get thoughts about Cummings’ performance. “Voice” is too short to tell us much, but it’s interesting to hear Cummings talk about his work. Pooh and Walt Become Friends lasts two minutes, 43 seconds and discusses how Disney brought AA Milne’s work to their stable. It’s a decent synopsis of the process, albeit a promotional one. Finally, Pooh and Friends Come to Life goes for three minutes, 16 seconds and presents narration from Carmichael. She tells us the methods used to develop the non-human characters on screen. The piece benefits from good behind the scenes shots but the information lacks much substance. The disc opens with ads for Mary Poppins Returns and Pixar Short Films Collection 3. No trailer for Robin shows up here. A second disc offers a DVD copy of the film. It lacks any extras. An unusual extension of the Winnie the Pooh universe, Christopher Robin suffers from too many flaws to become a total winner. However, the movie’s sense of warmth and wit allow it to go down easily and turn into an engaging fable. The Blu-ray boasts excellent visuals along with good audio and minor supplements. Robin gives us an enjoyable family film.